On the weekend I happened to pass by a local bookstore that was advertising Vancouver author Madeleine Thien would be there on Wednesday to promote her latest book, Do Not Say We Have Nothing, that was shortlisted for the Man Booker Prize last year. So I went back to the bookstore this evening and was surprised to meet a soft-spoken woman about my age, and very humble and gracious but also but full of interesting observations and perspective about issues. 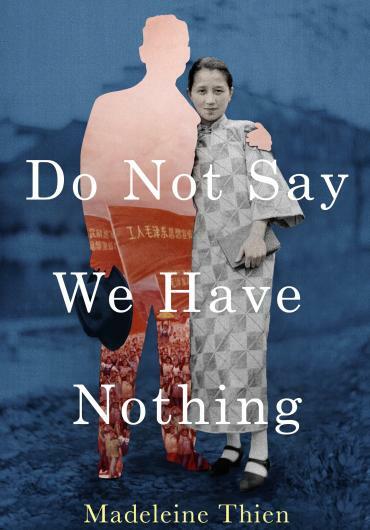 Do Not Say We Have Nothing is set in Vancouver in 1990, when a 10-year-old girl and her mother invite a teenager from China to come stay with them, having fled Beijing following the Tiananmen Square crackdown a year earlier. We learn more about the relationship between the fathers of the young girl and teenager, the Cultural Revolution and the June 4 massacre, as well as the cyclical nature of Chinese history, and familial relationships. 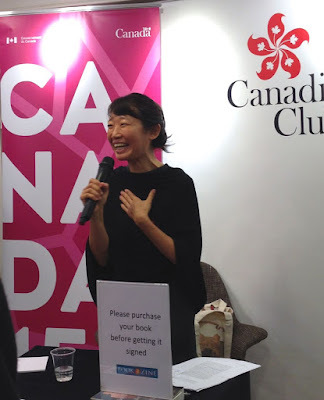 At the event, sponsored by the Canadian government, Thien explained the title of the book comes from the Chinese anthem, which was originally from a song by Eugene Pottier called L'Internationale that was later translated into Russian, and then Chinese. The lyrics have the phrase, "Do not say we have nothing, we shall be masters of the world!" 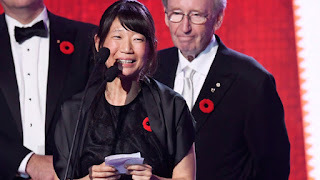 She also explained this is a novel she has wanted to write since she was 14, when she saw the protests in Tiananmen Square in 1989; at first she was sympathetic to the students, and then realized later it was the ordinary people living in the area who tried to stop the tanks and guns. Thien also said the characters were from her imagination and not composites of people she knew. Someone asked if China had reacted to her book, and she said because it wasn't translated, there would not be a response, though she had gotten interest in publishing the book from publishers on the mainland. However, they did admit now was not the time to translate it and publish it. She understands, but hopes that eventually it will be made available to them. One of the interview requests she had was from a Chinese state newspaper (she did not name it) and one of the questions was how she felt about shaming China... she refused to answer the question and felt that when it was translated into Chinese she would have no control over it -- a situation many foreigners fall into when asked for a comment from state media. Thien was also asked how she felt about the divisions in Hong Kong at the moment -- she did spend a bit of time here teaching creative writing at the City University. Referring to the Occupy protests, she felt the students were passionate about their beliefs, and that it was important to know where we stand as a city, as a nation and what kind of place we want to be. So now I have a signed copy of Do Not Say We Have Nothing in my hands and have started reading it. It seems like it will be a sad, intense story, but one every other person of Chinese descent can relate to in one way or another.